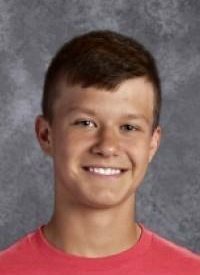 Sublette’s Jaren Giesick is the fourth winner of the Billy’s 10 Best Scholarship. Giesick was introduced as the winner during Thursday night’s On the Sidelines at Billy’s. Giesick is a wide receiver and cornerback for the Larks. He also plays basketball, runs track, plays golf and made it to state, and is involved in student council, FFA, and KAY Club.